Superlight folding Trail/Dirt tyres with kevlar bead. Designed for dirt jump use the H-Block is lightweight with fast rolling centres with a little bit of extra grip on the edges. Split twin rail centre design, forming H shapes, provides edges for drive and braking grip with minimal vibration. Taper thickness tread from the centre outwards provides increasing traction the further over you go, yet saves weight in the central area. 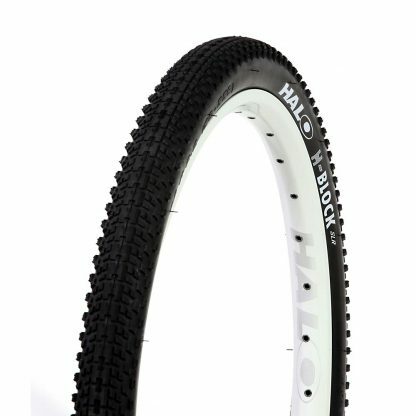 Utilising a folding Kevlar bead the H-Block SLR is the lightest tyre in the H-Block Range. Black or Black with Whitewall.